Bangor Savings Bank, headquartered in Bangor, Maine, embodies customer experience. Founded in 1852 and driven by the motto “You Matter More”, the community bank continuously strives to create a seamless and convenient experience for the businesses and consumers it serves. Yet as a bank comprised of border communities, with customers spread across Maine, New Hampshire, and even Canada, the financial institution’s remote deposit capture (RDC) offering came up short. Check 21 legislation, which enabled the electronic exchange of check payments, made image-driven deposit of U.S. items fast and convenient, but until recently, Canada still required paper checks. That saddled Bangor Savings Bank, and its valued business customers, with delays, foreign exchange (FX) risk, and sluggish cash flow. When Canada recently legalized image cash letters, Bangor Savings Bank saw a new opportunity to improve service. Jaime Shapiro Berg, the bank’s Director of Treasury and Payment Services, jumped into action. A project team was formed and the bank streamlined its entire Canadian payments work flow, through a collaborative effort with a new correspondent banking partner and an enhanced relationship with their RDC provider, Deluxe Treasury Management Solutions. A diverse base of customers bank with Bangor Savings Bank, ranging from manufacturers to paper and pulp companies to real estate firms. “Many of our business clients have both consumer and commercial Canadian customers. With Maine and New Hampshire being border states, we see many of our business clients selling and providing services in Canada along with Canadian consumers paying for services received in the U.S. or bills associated with a secondary home in Maine or New Hampshire. 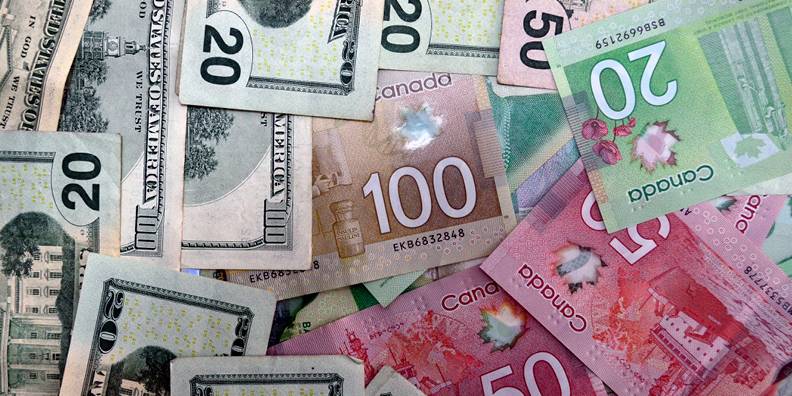 These businesses accept checks in U.S. and Canadian dollars, primarily drawn on Canadian banks,” said Berg. “Thirty percent of our Canadian check volume is in Canadian dollars,” Berg said, noting that during a three-month period, they averaged nearly $5 million in U.S. and Canadian deposit volume, representing approximately 615 items. For their U.S. items, numerous business customers relied on the desktop RDC product from Deluxe; they appreciated its convenience and efficiency. However, Canadian items still required a trip to the bank. Depending on volume and location, businesses might only make this trip once or twice a week, which hampered their cash flow. For Bangor Savings Bank, the challenges posed by paper checks were far more significant, particularly around FX. The bank posted a daily Canadian Exchange Rate that the customer would receive on the day the check was deposited at the bank. With 58 branches across Maine and New Hampshire, the bank relied on couriers to transport their Canadian items. First, they collected checks from the individual branches, then consolidated all deposits at the bank’s operations center in Bangor. Smaller branches, with lower volumes, might only receive pickups twice a week, further delaying the cycle. In a final step, checks were sent to the Federal Reserve. Berg knew there had to be a better way than physically transporting paper checks. The project team issued an RFP for their international payments, and replaced the Federal Reserve endpoint with a more sophisticated correspondent banking partner. Right away, the new correspondent bank helped Bangor Savings Bank implement Canadian check imaging at their 58 branches. Tellers scanned Canadian checks and sent the items for electronic deposit. While this new efficiency benefited the bank, their business customers still needed to drive their Canadian items to the nearest branch. Berg reached out to Deluxe to see if their current RDC solution could be enhanced to read Canadian routing numbers. The solution also needed to be simple and intuitive for RDC business customers. In less than a month, Deluxe rolled out the enhanced capabilities. Bangor’s clients set up a Canadian check location, which enabled them to deposit a Canadian check into any of their accounts. With electronic processing now possible via RDC and at the teller lines, Bangor Savings Bank took one final step to streamline their process. “We combined the two image cash letters, the one from Deluxe and the one from the teller line, to create one for U.S. dollar checks, and one for Canadian,” Berg explained. Now, instead of laborious and slow movement of physical checks over the better part of a week, the bank can send two electronic files to their correspondent bank every day. Customers were pleased to adopt the new Canadian functionality. Customers have stronger cash flow, more flexibility with their working capital, and speedier notification of any issues. For Bangor Savings Bank, creating an end-to-end electronic work flow gives the bank a strong foundation for future enhancements. Up next, Berg plans to evaluate mobile RDC as a companion product for existing RDC customers. “That would provide more flexibility if they have a sales force out on the road who collect checks, or remote small offices. They would have the ability for those employees to scan checks into the same account, without needing a scanner,” she explained. To other financial institutions, Berg simply challenges them to ask, why not? With their seamless Canadian deposit process, “People couldn’t believe that it was as simple as it was. Part of it is just asking the questions, having the foresight,” she said.